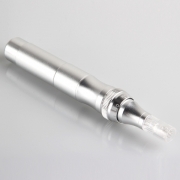 Micropen Silver- Non-invasive- is based on the principle of stimulating the skin to use its regenerative quality. 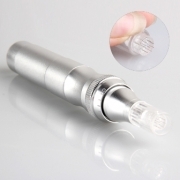 Non-invasive collagen and elastin stimulating device. As a result of the stimulation produced by your skin through this procedure, we obtain the natural healing power by regenerating the skin with the increase of collagen and elastin and resulting in a fresher and smoother new skin. Decreasing or at least eliminating marks, stretch marks, and scars from old breakouts. 2) Speed controlled on the pen. Plug type, easy to carry, and operating. 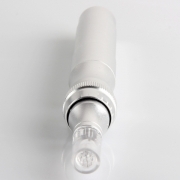 Rejuvenation: Skin tightening, reduction of fine lines and wrinkles, minimizes pore size. Meso-Glow skin: Administration of vitamins and other agents for anti-aging. Acne Scar Reduction: Reduce the depth of permanent acne scars and pits. Stretch Mark reduction and improvement. Stimulation of Hair Growth (Premature Balding), treats alopecia.